Simple said, these are the best pancakes ever. This is from the Highland Grill in St. Paul, MN. These are the "Jack Cakes". 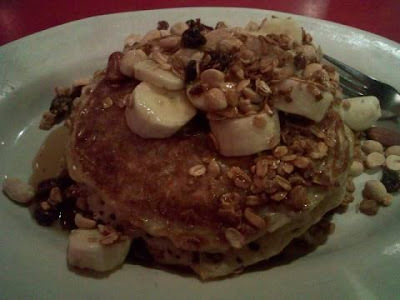 As stated in the menu "Three oatmeal pancakes topped with peanuts, house made granola, banana, blueberries, raisins and honey. Meets your daily requirement for everything." If I die and go to heaven, I hope St. Peter's cafe has these available. My running is still not happening, however, I'm just a few days away from lacing the shoes up again. I'm looking forward to this. However, I admit, I have become exactly what I never wanted to become, someone obsessed with running. When I started running, I enjoyed it for the fun of running, being outside. Along the way, I became more passionate about running and more serious. Now, I live for running. Don't get me wrong, I live for my wife, kids, and family as well. I live for good friendships and great experiences. But I also live for running. So somewhere along the way, I decided that I need to invest in my running to keep it enjoyable. First it was just the perfect shoes, then better gear, then challenging and races that show off great parts of the country. Is there more? Oh yes. Then it became the running groups and running friends. It became that my sports doctor became my primary physician. 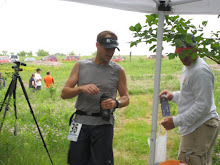 Then I couldn't figure out how to plan/train for ultra runs; so I hired a running coach. I wanted to run longer, faster and maintain good healthy habits. Okay, I could use a nutritionist. I should probably work on my bio mechanics and injury prevention so my stress fracture doesn't come back and I can stay a healthy injury free runner for a long time. Enter my new friend, the physical therapist who evaluated my running stride and now wants to get a closer look at my bio mechanics. Hmmm... is this still fun? You bet. All for the run of it.